Colin White peeled himself off the ice and held his right hand over his right eye. New Jersey's veteran defenseman, still somewhat stunned after taking a deflected puck to the face during a preseason practice in September, was half-blind as he skated to the exit. "It was bleeding and I couldn't see, but I didn't know why I couldn't see," White said. "I thought it was just because my eyelid was ripped and hanging down over my eye, but when we got to the hospital and they opened my eyelid up, I still couldn't see." Now White was really nervous. Now, he thought, everything was in jeopardy. If he couldn't regain the vision in his right eye, his hockey career would have been over, his livelihood crushed. "My first question was, 'What's my vision going to be like?' " he recalled. Six months later, White still is an NHL player, still the leader on the Devils' blue line. Even though he'll never get full vision back in his damaged right eye, it hasn't stopped the bruising blueliner. White's perseverance through his near-miss disaster has afforded him a new perspective on life and hockey. As a result of his resolve, the New Jersey chapter of the Professional Hockey Writers' Association tabbed White as their nominee for the Bill Masterton Memorial Trophy. "I really appreciate what I do," said White, who acknowledged the Masterton Trophy nomination as an honor. "Sometimes you can get away from that, but I believe everything happens for a reason and I was fortunate enough to be able to keep playing. It was definitely a question mark of whether I was going to come back and play at all." White said hockey talk in his house is rare, but during those months of uncertainty after the freak injury happened, he had numerous conversations with his wife, Amy, about his status and his future. White wondered if his career was over. "The thought definitely crossed my mind," he said. "I didn't know because it takes such a long time to heal. (My vision) got to the point that it is now and I guess you just get used to it." 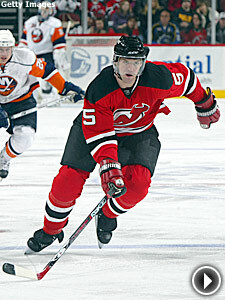 Even with blurred vision in one eye, White has been a force for the Devils. Without White for the first 20 games of the season, the Devils went 8-10-2. Since his return Nov. 21 in Pittsburgh, the Devils have shot up the Eastern Conference standings and are contending for the top overall seed. White has played in 48 games and has helped the team put together a 2.27 goals-against average, which was fourth in the League after Wednesday's loss to the Rangers. He averages more than 19 minutes of ice time per game, and is a key contributor to the Devils' ninth-ranked penalty kill. The only noticeable difference in White on the ice is he now wears a three-quarter visor, similar to what Ottawa winger Dany Heatley wears as a result of the left-eye injury he suffered while playing in Switzerland during the lockout. "I don't really notice it when I'm playing – I guess I do a little, but I don't think about it," White said of his blurred vision. "When I'm home, if I close my good eye I can't watch TV or read or see anything through my right eye." White, who never wore a visor before his injury, said he's not a fan of the shield but wears it nonetheless because he's thinking about life beyond hockey, and about his kids, Jordyn and John. "I was told this is going to be the way your eye is so do the best you can to protect your other eye because right now I can live a normal life and play with the way it is," White said. "(The visor) isn't something I want to wear, but it's something I have to do. If that's what it takes to play, well, you know, I'd rather play than not play." White's injury has prompted teammates Jamie Langenbrunner and Jay Pandolfo to wear visors this season, but by no means is he going to become a spokesperson for the League on this controversial subject. "You always see guys questioning should I put a visor on or shouldn't I after they see something like this, but everybody has their own opinion and everybody is old enough to make those decisions on their own," White said. "That was my decision to wear no visor, but there are always other risks. You don't think about them, though. You just think about playing." As for the abnormal size of his visor – it curves slightly below his nostrils – White said he hears jokes about it, but at least he can see the guy joking with him. "It's probably the biggest visor you can get," White said. "I get teased about it sometimes, but like I said, I'd rather be playing and getting teased."